Stila Lip Glazes are an iconic product of Stila. They were one of the first items launched and are still going strong, having received the thumbs up from many celebrities. What really makes the Lip Glaze an iconic product is the innovative packaging. Where most lip glosses come packaged in a tube with a separate applicator built into the cap, Stila Lip Glazes comes in a clear clicky pen and a brush. What this does it make the product more portable and easy to use as you don’t have to fiddle with opening the gloss and using 2 hands to handle this product. Using the Stila Lip Glaze is simple. Just twist the bottom of the pen about 2 times and wait for the colour to ooze out of the brush. Then, apply to lips. I find that 2 turns is just about right or you risk having a lot of goopiness on the brush and wastage when you eventually wipe it off. In terms of colour, I find that the Stila Lip Glaze doesn’t have strong colour. But then, it is supposed to be a lip gloss which is usually sheerer anyway. So, what you see in the tube is actually a lot stronger than what you see when you apply on your lips. That said, I found that the Stila Lip Glaze in Papaya has a nice peachy colour that really suited me. It is just a tad lighter than what you see in the body of the pen, which is nice and I can use it straight by itself. I took this Lip Glaze with me on holiday and I am happy to report that it served its purpose well. The Lip Glaze kept my lips shiny and glossy and it is not sticky! Even after the initial goopiness has settled and after a couple of cups of coffee, the shine is still present – very pretty. I do have 2 gripes with it. It is easy to push out excess lip gloss if you don’t control the clicky mechanism. One turn may yield too little and 2 turns may yield too much. The other is the scent. 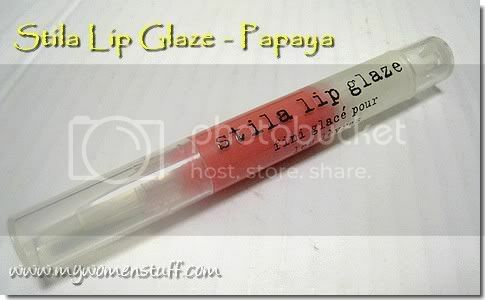 I am quite unfussy about scents but I found the scent in the Papaya lip glaze a little strong. That said, I know of people who absolutely love the scent in Stila Lip Glazes, so its up to you. The Stila Lip Glaze retails at RM85 each and is available in lots of colours at all Stila counters. I really like Papaya – its the perfect my lips but shinier with a hint of peach-pink that is just gorgeous.There are some darker colours but I prefer a light gloss when I do wear it. PREVIOUS POST: Back from the holidays! No wonder everyone’s raving about this!! Look at your lips!!!! I love the shine, its not overly “done” kind of shine, but just the right amount of plumpness…i love it!!! I wonder what kind of Papaya smell, I’m not keen on really strong scented gloss! Oh my…that gloss looks amazing on you! I’m waiting on some Stila stuff to come from a friend – mid Sept feels like forever! @Monstro : Its pretty amazing. Glad you also got Papaya! @prettybeautiful: My only concern with getting it online is that sometimes you don’t know how old it is so I usually steer clear of glosses online. @MisSmall : Nope it certainly isn’t sticky! I really like the Papaya range from TBS and true – strawberry is too sweet for me. @Tine : LOL… I used to too but the Stila texture is worth it!